False data published by a psychologist influence policies for treating the mentally retarded. A Nobel Prize-winning molecular biologist resigns the presidency of Rockefeller University in the wake of a scandal involving a co-author accused of fabricating data. A university investigating committee declares that almost half the published articles of a promising young radiologist are fraudulent. Incidents like these strike at the heart of the scientific enterprise and shake the confidence of a society accustomed to thinking of scientists as selfless seekers of truth. Marcel LaFollette's long-awaited book gives a penetrating examination of the world of scientific publishing in which such incidents of misconduct take place. Because influential scientific journals have been involved in the controversies, LaFollette focuses on the fragile "peer review" process—the editorial system of seeking pre-publication opinions from experts. She addresses the cultural glorification of science, which, combined with a scientist's thirst for achievement, can seem to make cheating worth the danger. She describes the great risks taken by the accusers—often scholars of less prestige and power than the accused—whom she calls "nemesis figures" for their relentless dedication to uncovering dishonesty. In sober warning, LaFollette notes that impatient calls from Congress, journalists, and taxpayers for greater accountability from scientists have important implications for the entire system of scientific research and communication. 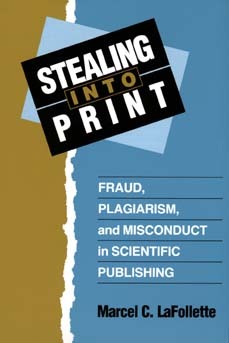 Provocative and learned, Stealing Into Print is certain to become the authoritative work on scientific fraud, invaluable to the scientific community, policy makers, and the general public. Marcel LaFollette is Associate Research Professor of Science and Technology Policy at George Washington University. Author most recently of Making Science Our Own: Public Images of Science, 1910-1955 (1990), she is also editor or co-editor of several books in science studies.